Instead, everyone was all over Blazejowski. No one questioned her calls or spewed insults. She was the object of their adoration, surrounded by people wanting an autograph or seeking a photo opportunity. Being one of the greatest names in women's basketball brought about that scenario, one that Blazejowski did not expect. After all, how many players can say a member of the Naismith Memorial Basketball Hall Of Fame refereed their game? 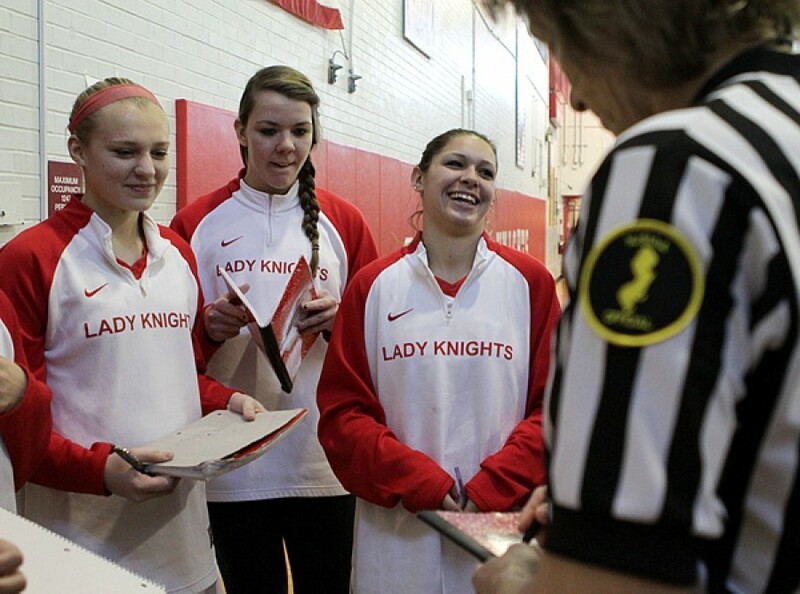 "It was so sweet," said Blazejowski, who was a basketball and field hockey official while in college. "It was delightful that they made a big deal about me. Referees really aren't supposed to be noticed. It was pleasant and surprising. It's nice when people remember." The players on both sides, many only 14 or 15 years old, actually had no clue until Friday night or Saturday morning. Morris Hills coach Bill Nieman made sure they got educated quickly. Morris Hills athletic director Rob Haraka saw Blazejowski, in her second year of officiating, was scheduled to do the games and mentioned it to Nieman. The veteran coach then told his varsity players to Google Blazejowski, winner of the first Wade Trophy and a three-time All-America selection during a stellar career at Montclair State. "I wanted the girls to know who Carol is and to understand she's one of the reasons why they have so many opportunities," Nieman said. "If you them what Title IX is, most of them wouldn't be able to tell you what it means." Thanks to Nieman, they're no longer clueless. The history lesson was well-received and made an impression. "I think it's cool that she's a ref," said freshman point guard Taylor Masino of Blazejowski, the New York Liberty's general manager for 14 seasons. "If I were her, I'd stay involved. I'd keep it alive." Masino noted that "there was nothing arguable" about Blazejowski's calls. Another Morris Hills freshman, Courtney Isgett, appreciated having Blazejowski serve as an official. Isgett realized Blazejowski was "a big deal" when freshman coach Lara Hirshenson wrote her name on the chalkboard in the team room and provided a few details prior to the game. "She was one of the best refs we've had because she has so much experience," Isgett said. "She was straightforward and made the game enjoyable." Isgett noticed that Blazejowski shot - and made - a little hook shot while waiting for the Scarlet Knights to take their places prior to a free throw in the third quarter. "It went right in," Isgett said. Blazejowski's presence was a thrill for former Sparta standout and current coach Cathy Wille, who played Division I basketball at Wake Forest. Wille asked Blazejowski to autograph the front of her scorebook. "When Bill told me, I said 'Are you kidding me?'" Wille said. "I actually got chills. Carol was such a big influence on me along with players like Anne Donovan and Ann Meyers. Seeing her and talking with her brought me back to my childhood." Blazejowski, who averaged 31.7 points per game during her college career, was a cadet last year. She's doing freshman and JV level games now. "I enjoy it," Blazejowski said. "I don't do it for the money. I get exercise, stay involved with the game and see the young talent. "I've reconnected with a lot of people from the past. I think I'll always keep a hand in basketball. I can't see myself out of it." Although Blazejowski has been a player, executive and official, she never considered coaching on the college or professional level. For four seasons, she guided the travel team her son, Luke, plays for. "Coaching is tough," she said. "I give them a lot of credit. I had very high standards as a player and couldn't accept anything less than those standards. There's so many different talent levels. It would be frustrating for all of us." For the time being, Blazejowski, scheduled to return to Morris County this weekend, is perfectly content with spending time in high school gyms. The warm reception she received at Morris Hills is part of the reason why. "The second I walked in the door, everyone was so welcoming," she said. "It was a wonderful experience."